Today I am going to show case a plant which is abundant inside as well outside of my house. This is so because it's very easy to grow, easily adapts to the environment, easy on care. Yes, what I am talking about is the Arrowhead plant( Syngonium podophyllum). 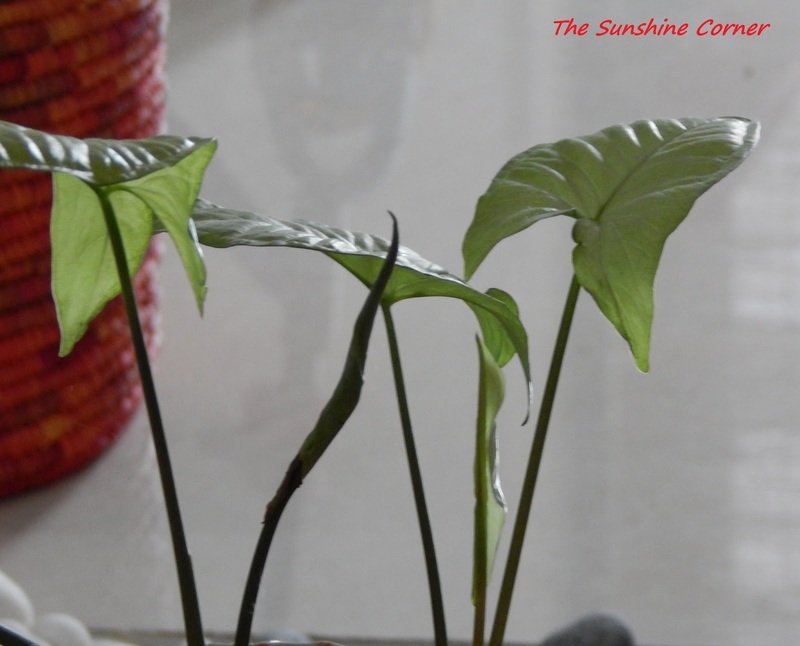 The arrowhead plant is a great container plant for shady balcony gardens and a plant which does better indoors. Leaves initially are heart shaped and later as they mature, develop into arrowhead shape. They are generally green in color with silvery white or cream variegation. There are many varieties that include variegated leaves of differing shades. Green varieties requires average light and variegated ones requires more light. I have tried growing a sapling picked up from my mothers place which has a different shade initially but when it grows in my house it turns into normal green one. Then I realized that it is due to the light exposure. 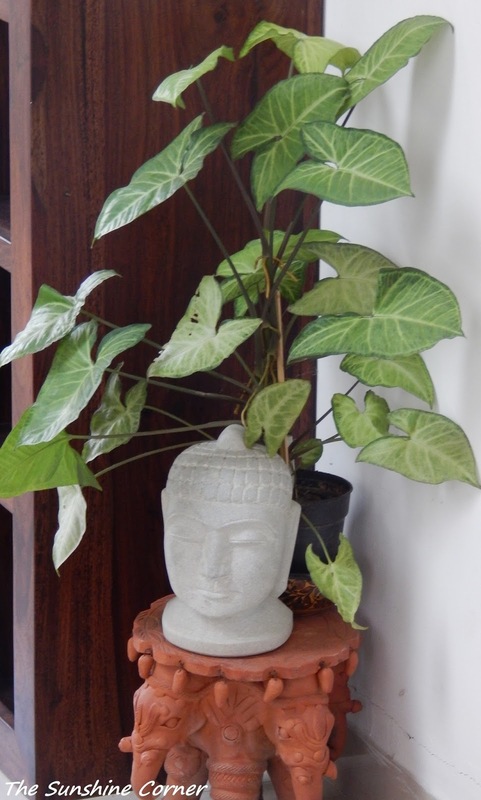 Avoid keeping them exposed to direct sunlight as the leaves may have a burnt look. As it grows it tends to climb up with support sticks. You can see tiny aerial roots along the stems. You can also prune the plant to keep the bush like appearance or support it using the moss stick. It grows well in the moist soil. Keep them well watered in summer and less watered in the winters( I water it once in 3-4 days). You can use potting mixture, always remember to use a well drained container. Propagation is by stem cuttings, or by division. Cut at a node where there is slight root protrusion. Keep in water for few days till roots develop and then it is ready to be potted. Propagation can also be done by division. I have also tried them growing in water, changing water for every two weeks. For obvious reasons the number of leaves are less but they do add on to your décor quotient. Same pinch Safal.. Ha ha.. 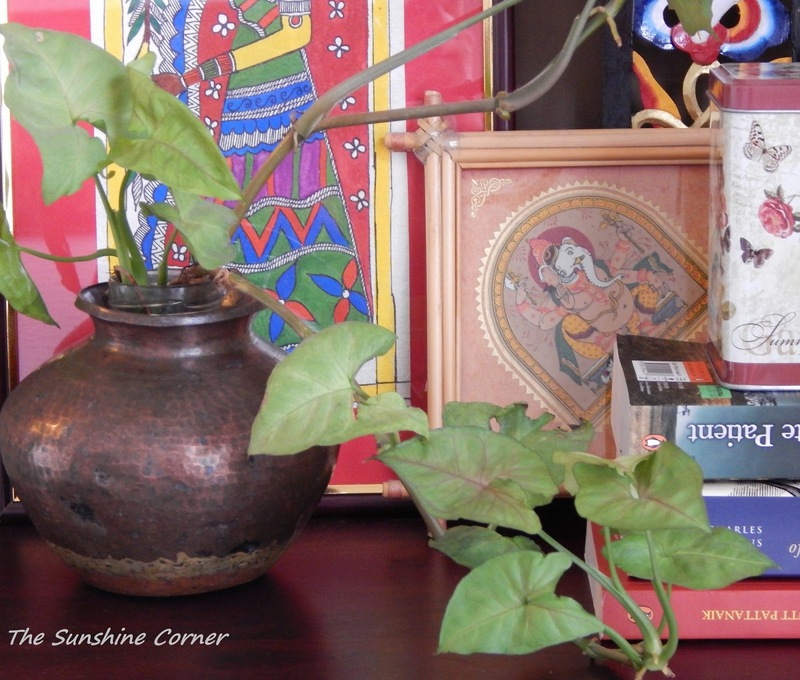 I agree with you that this plant is one of the easiest plant to grow indoors. once it is established in your garden, it becomes invasive. I agree that it is invasive and every time it's saddening to pull out those extra veins.